Details will be followed in my future articles. Constitution or genetic code is made by permutation and combination of the above factors. First let us consider rashi and planets. Rahu and Ketu are shadowy planets and have no material existence. For constitutional prescription in homoeopathic remedies, understanding the patient is most important. In the same manner, in astrology, understanding nature of planets, houses and signs is important. 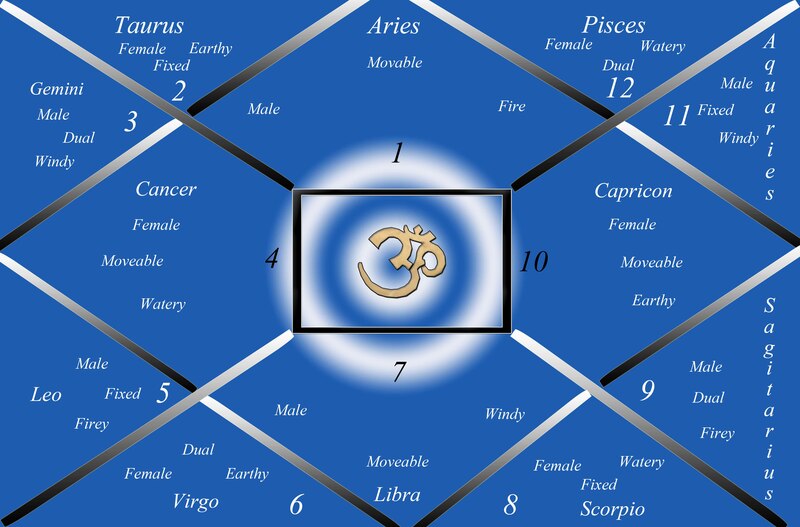 Once we understand the most prominent signs, houses and planets in horoscope of person, it is very easy to know his disposition, correlate with the case and find the remedy. Given below are brief introduction of the same. Lagna is what the constitution and personality of person is and the position of the Moon signifies his/her emotions. So just by knowing the lagna and moon signs of a person, we can tell whether the person is male or female dominant. For example: If a person’s ascendant is Aries which is a male rashi and Moon is in Leo which also a male rashi, we can tell for sure that such a person is/has more male qualities. If he is a male it would be more pronounced and if the person is a female, she will have a personality and nature which is male dominant. Movable rashis as the name suggests- they do not like working from one place and have lack of concentration and are always on the move. They are restless in nature and find difficulty in concentration. By just knowing that a person belongs to a movable sign, we can arrive to a conclusion as to the job he/she will be comfortable in. If you ask him/her to work in one place, the person will get bored. But given a job which involves travelling he/she will love it. They are more psoric dominant. Rubrics :- travel desire , restless , lack of concentration . These people like to sit in one place and work, don’t prefer much change and are very focused . We can say that they are more psychosis dominant. They are good in research areas, have good concentration power and are persevering in nature but can be indolent. These signs are ruled by Mercury and Jupiter .They can be movable at one time and fixed at other time. So, they are most flexible and can adapt to different situations. But this may lead to indecisiveness and delay in taking decisions. (a) Fire signs:-They are 1, 5 and 9 – Aries , Leo and Sagittarius respectively. They belong to Dharma trikone. As the name suggests these are hot constitutions and dominated by the fire element. They are generally aggressive, ambitious, have leadership qualities, egoistic etc. Rubrics are:- ambitious, easily gets angry, contradicts intolerant to, egoistic, positivity, etc. (b)Earth element:- They are 2,6,10 – Taurus, Virgo and Capricorn respectively. They belong to Artha trikone . Means related to food , money , resources ,work etc. Rubrics :- fastidious, anxiety for money matters, cautious , business aptitude etc. (c)Wind element:- They are 3,7,11 – Gemini, Libra and Aquarius respectively. They belong to Kama Trikone. These are intellectual signs and like to show or exhibit there qualities .They want the attention of the audience like actors, performers and even scentists who want to show their knowledge. Rubrics:- Lamenting for appreciation, attention seeking, hysteria, desire of company, making verses. (d)Water element :- These are 4,8 and 12 –Cancer, Scorpio and Pisces respectively. They belong to Moksha trikone. These are emotional and sensitive signs .They are worrisome and think a lot about small problems. They are nature lovers and preservers and are very emotional. So, now we are ready with first level of diagnosing a constitution, whether the person is male or female , movable fixed or dual , and which element dominates his/her personality. So, the first level of classification of individual which will show his basic trait has been covered. I have mentioned all the signs and their characteristics in the above picture for proper understanding. We will be dealing in rashi one by one in next articles . If a person who is an Aries dominant i.e, whose Lagna is Aries or has more planets in Aries sign will have characteristic of Male personality who will not prefer a static job (movable) ,will be ambitious and have leadership quality .